We are writing to urge you to consider making the funding of state-operated care for the developmentally disabled a priority of the Baker administration. For too long, state government has been divesting itself of its responsibility to provide care for the most vulnerable of its citizens, and has failed to adequately monitor and control the handover of human services to state-funded corporate providers. The state’s priority has been to boost funding dramatically to corporate residential providers, in particular, while at the same time slowly starving state-operated care, including state-run group homes and developmental centers, of revenue. 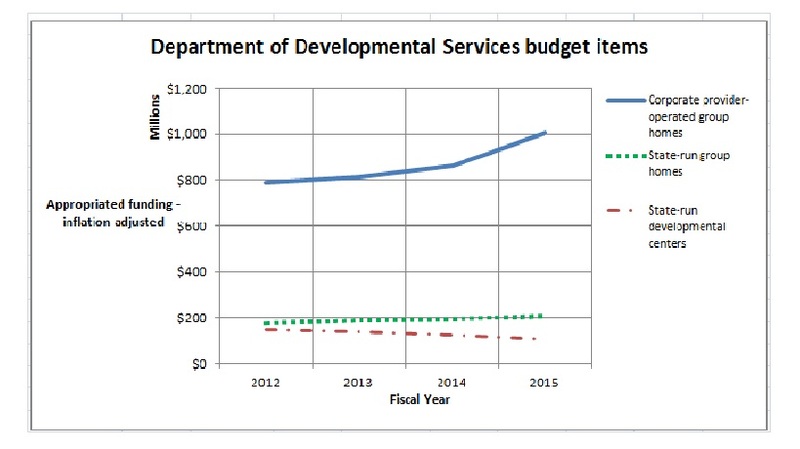 This has led to a gross imbalance in the Department of Developmental Services budget. The chart below depicts this imbalance. As the chart shows, funding to DDS corporate residential providers (line item 5920-2000) rose past the $1 billion mark for the first time in the current fiscal year. The line item was increased by more than $140 million –or more than 16 percent—over prior-year spending in FY 2015 dollars. At the same time, both the former governor’s and the legislative budgets either cut or provided much more meager increases for most other DDS line items. The state-run developmental center line item (5930-1000) was cut in the current fiscal year by more than 13 percent in inflation-adjusted dollars, while the state-operated group home line item (5920-2010) was raised by less than 7 percent. We have calculated that if the increase in the provider residential line item had been reduced by just 2.1 percent – to a 14.7 percent increase – as much as $18 million could have been redirected to the state-operated group homes, DDS service coordinators, the Autism Division, Turning 22 program, Respite and Family Supports, and the remaining developmental centers in the state. But the previous administration was not satisfied even with a $140 million increase in funding for the corporate provider line item. In late November, despite a projected $329 million budget deficit in the current fiscal year, the Patrick administration proposed a supplemental budget increase of $42 million in the provider residential line item. While the administration made more than $200 million in emergency “9C” cuts and proposed additional cuts to address the projected deficit, it included the $42 million in proposed supplemental funding for the DDS corporate residential line item in the same bill (H. 4536) proposing mid-year cuts in local aid and other accounts. In addition to the erosion of critical state-funded care, the state’s priority of boosting funding to corporate providers has created a poorly monitored system of DDS contractors that has financially benefited provider executives. Our own survey of the DDS provider system has shown that the state has provided between $80 million and $90 million a year to a bureaucratic layer of corporate CEO’s, vice presidents, executive directors, and other executives. At the same time, wages of direct-care workers in provider residences have been flat or have declined in recent years. We believe the misplaced priority on funding of corporate providers ignores the wishes of family members and guardians around the state for more choice and availability in state-operated care. DDS data show that close to 42 percent of the 372 individuals moved out of developmental centers in the state since 2008 were placed in state-operated group homes. Another 45 percent of those residents were transferred, at the request of their families, to remaining developmental centers. Just 13 percent of those individuals went to provider-run group homes. Yet, since 2008, 157 new provider-operated group homes have been built in the state, according to information provided by DDS. In that time, only 38 new state-operated group homes have been built, and three have been closed or converted to provider-operated homes. DDS has projected that it will build an additional six state-operated group homes, but will close or convert five state-operated facilities to provider residences. As a result of class-action lawsuits dating back to the 1970’s, the State of Massachusetts dramatically improved care in its state-run developmental centers, bringing them to a world-class level of care with dedicated, highly-trained staff. But starting in 2003, the Romney administration and subsequently the Patrick administration began efforts to close the state’s then six remaining developmental centers. Starting in 2008, the Patrick administration stepped up the closure efforts and shut the Monson, Glavin, Templeton, and Fernald Developmental Centers, in many cases over the strong objections of families and advocates of the residents there. And despite the demonstrated desire of families and guardians for the intensive and high-quality care that the developmental centers provide to the most profoundly developmentally disabled, the developmental center line item has been cut repeatedly since 2008. The current-year DDS budget cut the developmental center line item by more than 13 percent in the current fiscal year alone, as noted. We hope the Baker administration will consider restoring balance to DDS budget accounts by increasing funding to the developmental center and state-operated group home line items. State-operated care continues to be better monitored than provider operated care; and training as well as pay and benefits provided to staff in state-run facilities continue to be higher than in provider-run residences. Ultimately, only government is in a position to respond directly to the public interest and to the wishes of families and guardians of the most vulnerable people among us. Federal law recognizes that fact by designating families as the “primary decision makers” in the care of individuals with developmental disabilities [(42 U.S.C. §2001(c)(3)].